This Sunday, I was lucky to attend the Pearls of Icelandic Song concert at Harpa. It was a truly beautiful experience to hear some of Iceland’s traditional songs (lullabies, love songs, folk songs) performed beautifully by Natalia Druzing Halldórsdóttir and Bragi Bergþórsson with the peerless accompaniment by Birna Hallgrímsdóttir. The songs evoked Iceland’s stunning landscapes, the country’s compelling history, folklore and traditions, as well as the immense creativity and artistry of its people. Many people had told me that Culture Night would be a unique experience and they were right. It started early in the morning with the Marathon and ½ Marathon. While my time in the latter wasn’t that great, the energy of the run carried on to the rest of the day. Early in the afternoon, the city of Seattle was honored to be the feature of City Hall’s festivities owing to the invitation by Mayor Jon Gnarr to celebrate the 25th Anniversary of the Sister City relationship between Seattle and Reykjavik. It was so great to see so many Icelanders and their families enjoy the Quileute Nation’s traditions, performances by Tomten and Bob Culbertson, Bill Stafford’s photo exhibit, and for so many children to enjoy the puppet theater Giraffe & Staff. I heard that the thousands of Icelanders who enjoyed a cup of Seattle’s Best Coffee and Chateau Ste. Michelle wine were very impressed. Finally I observed the many thousands who enjoyed the performance of the White Sox All Stars. We are very energized by Reykjavik’s embrace of Seattle and we are determined to build on that goodwill. Seattle and Reykjavik have much in common and we look forward to stronger ties between both cities. I was invited to observe for one day the work of Focus on Nature, an Icelandic firm that offers week-long photography workshops for a small group comprised of amateur and experienced photographers, many of them Americans. The workshop involves taking participants around Iceland’s stunning landscape and holding daily evaluation sessions with world-renowned photographers (Seth Resknick from the U.S. and Ragnar Þór Sigurðsson from Iceland were the leaders during my observation). The workshop participants seemed to enjoy the camaraderie and learning. It was a very interesting experience that took us to the crater of Eyjafjallajökull and the southwest coast of Iceland. It should not be surprising that so many Americans participated in the workshop as U.S. tourists comprise the largest national group visiting Iceland this summer. Culture Night – Can’t wait for it! The organizers of Culture Night invited me to participate in the press conference announcing the program for Culture Night. I was pleased to note how honored we are with the City of Reykjavik’s invitation to the city of Seattle to be the guest of honor for that event. This year marks the 25th anniversary of Reykjavik’s and Seattle’s relationship as sister cities. The city of Seattle is bringing a great line up of cultural ambassadors (rock groups, musicians, puppeteers) and business representatives. I am pleased to note that members of the Quileute Nation will also attend to share their culture, traditions, and art. I know that Icelanders will immediately see the value of the relationship between the two cities. 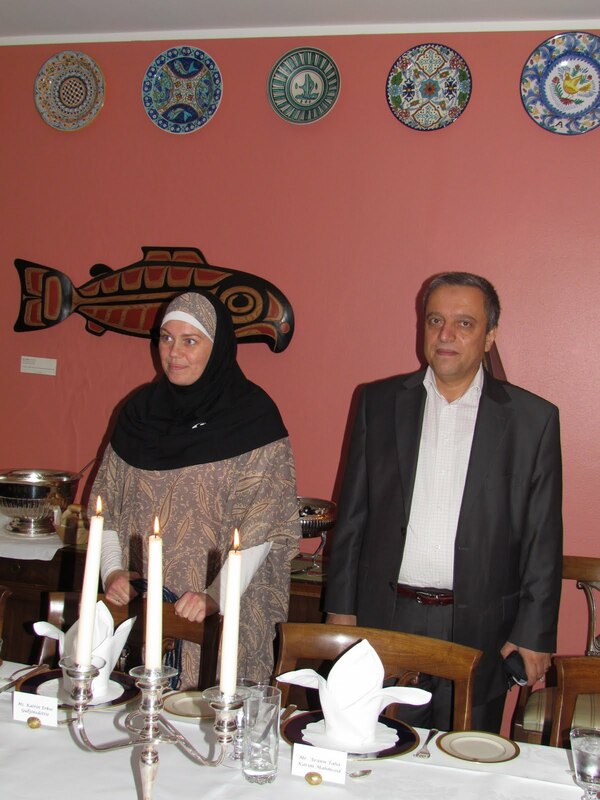 We were honored to host an Iftar dinner for leaders of the Muslim community in Iceland. As sunset approached (at almost 10 p.m. at this time of year in Iceland), our guests were able to gather and mingle. At the appointed moment, the muezzin chanted the call to prayer then led a brief ceremony. Then we all broke the fast together. 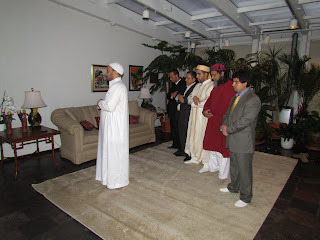 It was a good moment to reflect on the values we share with Muslims around the world. As President Obama noted recently, Ramadan is a festive time that is anticipated for months by Muslims everywhere and it is also a time of deep reflection and sacrifice. As in other faiths, fasting is used to increase spirituality, discipline, and consciousness of God's mercy. It is also a reminder of the importance of reaching out to those less fortunate - another one of the values we share with Islam. I look forward to further engagement with the Muslim community in Iceland and to learning more about their faith and experiences in Iceland. 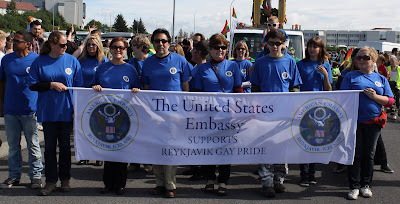 A group of Embassy volunteers marched in Reykjavik’s Gay Pride Parade a few days ago. We wanted to show our hosts that the United States supports the rights of lesbian, gay, bisexual, and transgender (LGBT) individuals to lead productive and dignified lives, free from fear and violence. We also wanted our participation to celebrate diversity. Aside from enjoying the festivities and seeing so many families along the parade route, we were heartened by Reykjavik’s reaction to our participation as we heard applause and many expressions of encouragement along the way. Iceland has a strong record of support for LGBT individuals and we were very proud to be a part of this event. Hawaii and Iceland: A budding partnership? Yesterday I met with Roald Marth and Richard Ha, CEO and Chairman of the Board of Ku’oko’a, a Hawaiian based enterprise with a vision to rid the state of its dependency on fossil fuels through the development and use of renewable energy resources. The similarities between Hawaii and Iceland are obvious: both are islands populated by extremely independent and enterprising people and both sit on enormous geothermal resources. We are optimistic that Iceland and Hawaii can become partners in renewable energy and other initiatives that take advantage of their respective locations as gateways to Europe and Asia respectively. There is a great deal of anticipation at the Embassy for our first-ever participation in Reykjavik’s world famous Gay Pride Parade. Our participation is meant to honor the courageous individuals who have fought to achieve the promise that all people can live with dignity and fairness under the law, especially those individuals who led that fight for LGBT individuals. We look forward to being a part of this event.